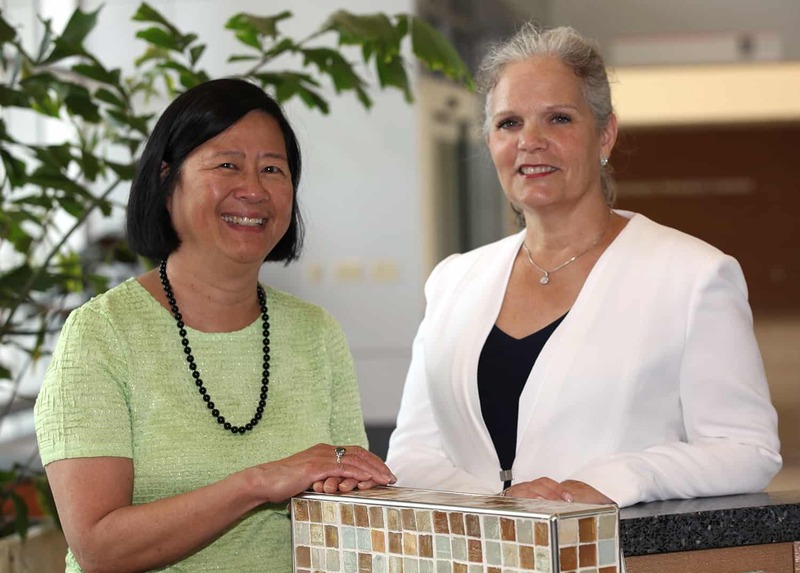 Jeannette Lee, Ph.D., professor of biostatistics in the UAMS College of Medicine, left; and Charlotte Hobbs, M.D., Ph.D., executive associate dean for research in the UAMS College of Medicine and the Pamela D. Stephens professor of Birth Defects Research, are the principal investigators on a $41.8 million grant that UAMS has received from the National Institutes of Health. UAMS Awarded Nearly $42 Million by NIH to Oversee 17-site Pediatric Clinical Trial Network Across U.S.
Sept. 21, 2016 | Sept. 21, 2016 | The University of Arkansas for Medical Sciences (UAMS) has been awarded $41.8 million from the National Institutes of Health (NIH) to oversee a 17-site pediatric clinical trial network that will provide medically underserved and rural children access to clinical studies studying environmental influences on early development. UAMS will be the Data Coordinating and Operations Center (DCOC) for the IDeA States Pediatric Clinical Trial Network (ISPCTN), and was awarded this after competing among several other institutions. UAMS’ award is part of a national seven-year, $157 million initiative announced today by the NIH called Environmental influences on Child Health Outcomes (ECHO). The ECHO initiative will investigate how exposure to a range of environmental factors in early development — conception through early childhood — affects the health of children and adolescents. The UAMS DCOC will be the central unit within the ISPCTN that provides data coordination, technical instruction, data standards, quality control and assurance and operational coordination for the clinical trials. Principal investigators are Charlotte Hobbs, M.D., Ph.D., executive associate dean for research in the UAMS College of Medicine and the Pamela D. Stephens professor of Birth Defects Research; and Jeannette Lee, Ph.D., professor of biostatistics in the UAMS College of Medicine. Both investigators bring much experience in their respective fields. Hobbs, a pediatrician and epidemiologist, has been involved with research initiatives supported through the Children’s Health Act since 2001. Lee has been the director of Data Coordinating and Operations Centers in other clinical trials. “The ECHO program is vital for improving the health of children in rural and medically underserved areas of Arkansas and across the nation,” said Pope L. Moseley, M.D., the executive vice chancellor of UAMS and dean of the College of Medicine. Arkansas Children’s Research Institute (ACRI) will receive $1.9 million from the NIH to fund one of the 17 clinical sites, to be led by Laura James, M.D., UAMS associate vice chancellor for clinical and translational research and director of UAMS’ Translational Research Institute; and ACRI President Gregory L. Kearns, Pharm.D., Ph.D.
UAMS Chancellor Dan Rahn, M.D., said UAMS’ role overseeing the clinical network is essential. The overall NIH award will build the infrastructure and capacity for the ECHO program to support multiple, longitudinal studies that extend and expand existing studies of mothers and their children. The NIH announcement can be found at www.nih.gov/news-events/news-releases/nih-awards-157-million-research-early-environmental-influences-children. These experiences encompass a broad range of exposures, from air pollution and chemicals in our neighborhoods, to factors such as stress, sleep and diet. These factors may influence any number of biological processes, for example changes in the expression of genes or development of the immune system. Research reported in this press release was supported by the National Institute of General Medical Sciences of the National Institutes of Health under award number 1U24HD090912-01.